Our editor in chief, Bobby Shortle, asked me if I could be the “Valiant guy” here at Talking Comics. I read all of the titles, so I agreed. Back in January I reviewed all of the Valiant releases, but in February I only reviewed one of them. My reasoning to not review every single issue is pretty straightforward. I feel that when a book is running at the same consistency, it doesn’t always need a review (particularly by the same person) every time. Good examples would be Batman and Saga. They are excellent and have been consistently excellent, so it’s not really news when they get high reviews, again. I will, however, be posting up reviews of any issues I feel stand out or change the quality of a series, either positively or negatively. I’ll also try to spotlight different books each month. 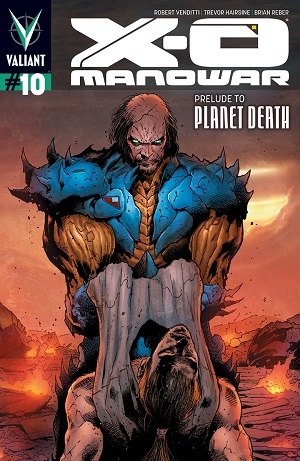 In March I’ll be looking at Shadowman and the beginning of “Planet Death” in X-O Manowar. For any books I don’t cover, I’ll be throwing up short reviews at the end of the month. Issue #0 focuses on Toyo Harada and a young psiot boy, Darpan. Like Harada, Darpan was born with his powers activated. The story shifts between Darpan’s mission and Harada’s childhood discovery of his powers. Harada is in contact with the boy via an earpiece throughout the mission to provide strength and keep the boy from becoming scared. Dysart uses this opportunity to provide a clear narrative that can jump between Harada’s past and the present. Dysart shows us that Harada has not always been evil nor would Harada consider himself to be. Harada’s intentions have always stemmed from a desire to make things better for others and remove power from the corrupt. The younger Harada and Darpan share similarities in their naïve black-and-white view of the world, which provides a very interesting dichotomy with the present day conglomerate operating Harada. As they say, the road to hell is paved with pure intentions. 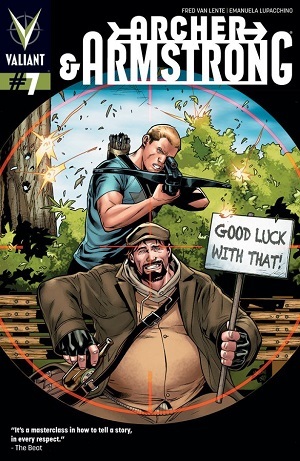 Issue #7 continues the team up of Archer, Armstrong, Gilad, and Kay McHenry as they crash into Kay’s old boss, Zorn’s headquarters to learn more about The Null’s plans. We are given a pretty large chunk of back story into what The Null is and what they are planning to do. If they are successful in their plans it would bring about the end of all reality. This issue is chock-full of action and some pretty humorous dialog between the immortal brothers. Because of the amount of information revealed in issue #7, I would advise against skipping it. For new readers, this might be a good time to jump on as well. With this issue, the lead up to the upcoming Harbinger Wars continues to unfold. This issue picks up where issue #6 left off. (I’ll get to that in a second.) 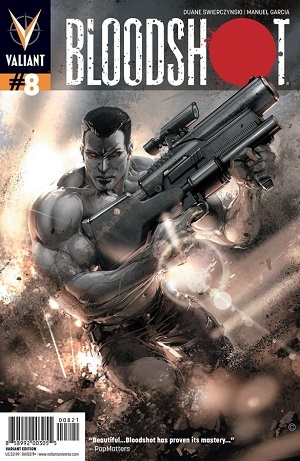 Bloodshot is shocked that instead of finding the computer containing his identity, he is instead confronted by children who know him and are angry. These were the same psyiot children Bloodshot gathered in the flashback that was issue #7. The mini-psyiots remember him as the Boogeyman and continue to attack him despite his attempts to help them. 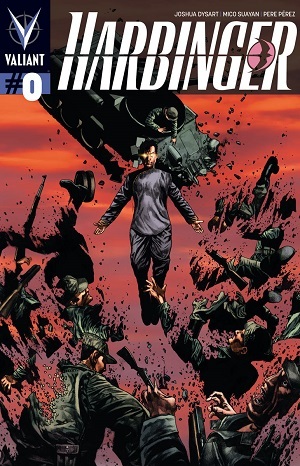 If you are planning on reading Harbinger Wars then you might want to pick up this issue as well as the next. Talking monkeys are back in issue #4! 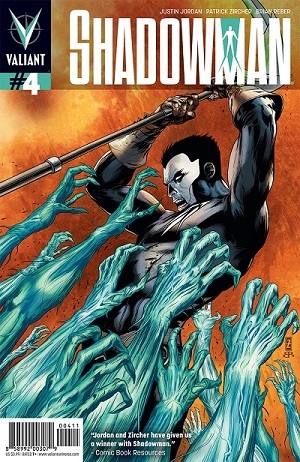 We get to see Shadowman almost the entire issue, as he fights to save Alyssa and battle Mr. Twist. It’s a lot of fun to see just how much of a badass Shadowman can be, especially, when he can call upon lost souls while fighting in the Deadside. Issue #4 would be an okay jump on point for new readers. The first arc is ramping up to bigger things, and issue #5 will finally bring our big bad, Darque, into the light… so to speak. Okay, just more awesome. X-O Manowar continues to show why it is the flagship series in Valiant’s relaunch. The series is full of emotion, action, and humanity. The focus of this issue is on the friendship between Aric and Gafti. The flashbacks to their youth help to cement the bonds we saw in the early issues of X-O. 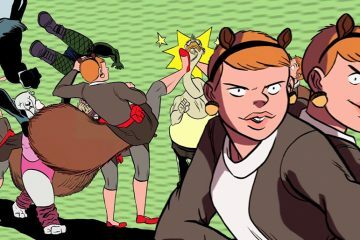 With the conclusion of the issue, Aric is fueled with more than enough anger and reasons to take on The Vine. (As if he didn’t have them before, right?) Issue #11 will kick-off the Planet Death event, so be sure to jump on then or pick up last issue to get the full prelude. 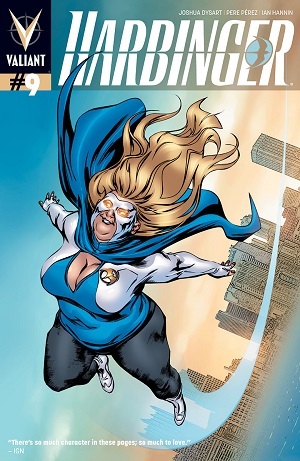 Everyones favorite fangirl, Faith, takes center stage for Harbinger #9. Faith’s “origin story” is told in flashbacks throughout the issue. We learn a lot about who she was before Harada and his Harbinger Foundation brought her to be activated by Peter. The issue is a lot of fun and full of references to Whedon-verses, comics, movies, and all things nerdy. It works, because that is who Faith is. She’s the fan just like all of us who woke up one day to be an actual super hero. Harbinger has been in a slight lull the past few issues, but this Faith-centric issue really brings things back up, and highlights the badassness of one of the supporting cast. With the rising presence of psyiots in Bloodshot and Project Rising Spirit in Harbinger, this would be a good point to start picking up both series. Although, Valiant has said that readers will be able to follow Harbinger Wars with out reading the tie-in series.